Rescheduling and restructuring of financing facilities are important aspects of financial systems including Islamic financial institutions. The purpose of these exercises varies. The most common is to relieve a customer’s financial distress, but another is to allow a customer to benefit from certain market movements, and there can be other motives besides. Nevertheless, certain practices in these exercises may raise Sharīʿah concerns that need to be addressed. This research adopts a qualitative approach based on textual analysis. All materials with regards to debt restructuring from a Sharīʿah perspective are collected from a review of literature such as textbooks, encyclopaedias, articles in academic journals, seminars, conference papers, dissertations or theses, online databases and internet materials. The legal issues related to rescheduling, refinancing and restructuring are critically examined, along with the opinions of classical and contemporary scholars about them. Several resolutions of various Islamic financial institutions, as well as case studies, are analysed. Islam places a very high emphasis on the obligation to pay debt. A debtor’s refusal to serve the debt on time, despite being able to pay, may subject him/her to punishment including imprisonment. Nevertheless, if the debtor is insolvent, the Sharīʿah urges the creditor, as much as possible without inflicting an excessive burden on him, to grant the debtor extra time till he is able to pay the debt. If the debtor is temporarily having a liquidity problem, but is still solvent (which is termed in this study as mutaʿaththir), the research maintains that restructuring is possible. This is provided that the right methodology is used and the relevant conditions of application are fulfilled. The Sharīʿah has no objection with regards to the extension of the Islamic financing facility without any addition to the original debt amount. However, if the debt restructuring involves an extension of maturity that results in an additional amount to be paid without entering into a new contract, the jurists unanimously disallow this practice as it is tantamount to ribā al-jāhiliyyah. This refers to the scenario in which the creditors agree to forgo part of their right in the debt obligation. The jurists have different opinions on this practice. The study found that there shall be no Sharīʿah issue if the relinquishment is done without any acceleration of the remaining debt. If this relinquishment is done with the acceleration of the remaining debt, the researchers view that this practice is allowed provided that there is no prior agreement made in the contract which stipulates this arrangement. This practice is also known as qalb al-dayn. While Mālikīs and Ḥanbalīs consider such practice impermissible, there is no direct discussion on the issue in the Ḥanafī and Shāfiʿī Schools. As for contemporary scholars, there are divergent views regarding the practice of qalb al-dayn, depending on the status of debtors―solvent or insolvent: (i) scholars unanimously disallow the practice of qalb al-dayn on insolvent debtors; (ii) some scholars view that qalb al-dayn for solvent debtors should be strictly prohibited; (iii) some scholars are of the view that qalb al-dayn is permissible on solvent debtors; (iv) some scholars allow the practice of qalb al-dayn on solvent debtors with certain conditions. It is noted that the conditions imposed vary from one scholar to another. The researchers believe that the practice of qalb al-dayn on a solvent debtor who is temporarily facing liquidity problems should be allowed as this may benefit the debtor, provided that certain conditions, which are deliberated in this research, are fulfilled. Though there are scholars who disallow this practice, this study maintains that such practice should be permissible as there is no clear evidence on its prohibition, and this practice may help to reduce the burden of the debtor. Increasing the Rental Amount Under this arrangement, the debtor and the creditor will renew the ijārah agreement with a new agreed rental fee. This practice is allowed provided that the due but unpaid rental (instalments in arrears) and other overdue payments that have not been paid by the customer are not factored into this new ijārah. Instead, it should be paid separately. Another restructuring option in Islamic finance is to convert a debt obligation into muḍārabah capital. The conversion of debt into muḍārabah capital was extensively discussed among classical Muslim jurists. The majority of jurists, except for some Ḥanbalīs, disallow the practice due to the absence of actual capital. They consider capital in the form of debt to entail gharar in the transaction. As a solution, the parties may want to ‘convert’ this debt into assets and then use the assets as a contribution in a muḍārabah arrangement. This arrangement refers to the process of exchanging the existing facility for equity. This practice is allowed if the existing financing facility is based on ijārah or partnership-based contracts such as mushārakah or muḍārabah. If the existing facility is based on a salebased contract, the same ruling regarding using the debt as capital in muḍārabah is also applicable. The above-mentioned parameters serve as a guide for the Islamic finance industry on the Sharīʿah requirements for debt restructuring. Failure to fulfil these conditions would probably lead to Sharīʿah non-compliance occurrences. 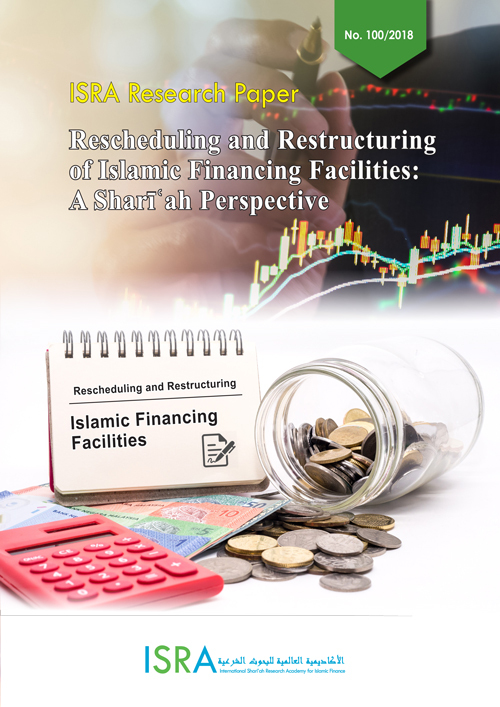 Islamic finance, Sharīʿah, debtors, rescheduling, restructuring.